I have spent my entire career on the interface of science and public policy. In public service, I have six years legislative experience as a Utah state legislator, eight years as a state-agency head, many years experience on policy and advisory boards, and the difficult-to-quantify experience of local/state/national, non-partisan and partisan political campaigns. As a scientist I have six years experience with industry, eight years with government, fifteen years with not-for-profits, and about fifteen years in academia. My primary interests as a physical geographer are (a) coastal processes of closed-basin lakes and (b) how to communicate Earth science concepts to teachers, policy makers, and laypeople. Presently I divide my year into three parts. Spring semesters, I’m adjunct in the Geography Department of the University of Utah and teach Geography of Utah, Urban Environmental Geography, and Analysis of Utah Landforms. Then, all summer long, I teach teachers through their school districts to go outside and teach “backyard Earth science.” During the fall, I write materials relating to the courses I teach. Where does Utah Citizens Counsel fit in? In 1973, I had a life-altering experience. I had dinner with a widower-friend of my father, Robert H. Hinckley. Mr. Hinckley suggested I run for the Utah Legislature. In college, I had been president of the Undergraduate Association. In Washington, DC my first job was with the National Academy of Sciences Board on Environmental Studies. Of course I did not know how many people Mr. Hinckley encouraged to run for the legislature. I ran and I won. I served three terms as a Republican member of the Utah House of Representatives. I saw how every legislator makes a difference, for good or for harm. Most legislators strive to make Utah a better, safer, richer place. But now I’m concerned that Utah politics is increasingly tribal, attacks are highly personal, and democracy is hurting. I join the Utah Citizens Counsel because every Utah citizen, not just legislators, can make a difference. I want the UCC to champion participatory democracy, to trust citizens and legislators with information, and to empower legislators and others to do what is right, let the consequences follow. Ph.D., Geography, University of Utah, 2006. M.P.A., Political Science, University of Utah, 1991. M.A. Geology, Wesleyan University, 1973. B.A. History, Bryn Mawr College, 1968. 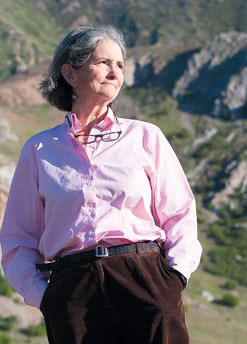 Founder and Chief Education Officer, Earth Science Education, 1993 to present. Candidate (Republican) for U.S. House of Representatives, 1990. State Geologist and Director, Utah Geological and Mineral Survey, 1981-1989. Geologist (1975-76) and Senior Geologist (1976-81), Ford, Bacon and Davis Utah Inc.
Institute of Politics Fellow, Harvard University, John F. Kennedy School of Government, 1978. Staff Officer, Environmental Studies Board, National Academy of Sciences, 1972-1974.